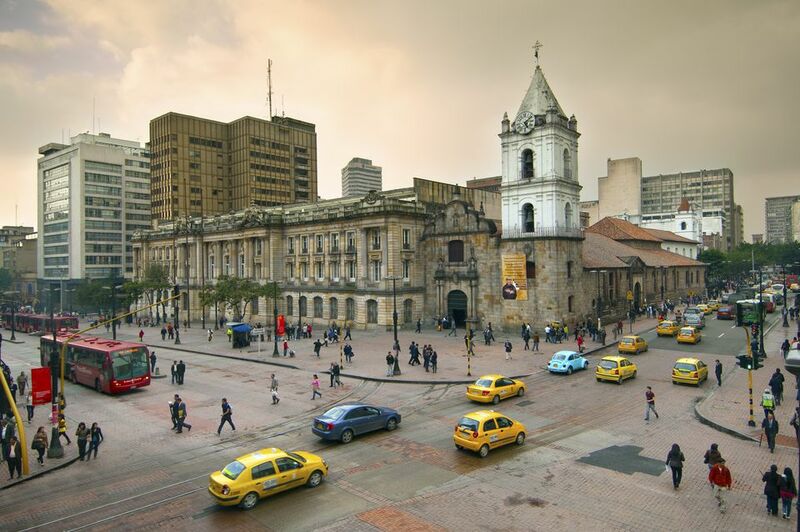 Bogota has much to offer any visitor, from the center of the historic district to ample parks and amusement centers, shopping, churches, museums, walks, and of course, restaurants, and nightlife. You cannot visit the city without heading to the top for a spectacular view 10,000 ft above sea level. There is a ​17th-century church at the top along with food options and souvenirs. Mundo Aventura park has mechanical games such as sky-coaster, roller coaster, hammer, and other adult amusements plus children's rides and a feeding zoo. Salitre Mágico park offers rides and entertainment for all ages while Parque Jaime Duque has rides, a giant map, exhibitions and a zoo. A big hand holding the world symbolizes God, and a reproduction of the Taj Mahal displays reproductions of famous paintings. The park now is more famous for its raves and parties with renowned DJ's. Bogotá's best known and most popular soccer clubs are Millonarios and Independiente Santa Fe. Buy tickets well in advance with rival teams. If you don't speak Spanish your hotel concierge should be able to buy the tickets for you. You'll find plenty of soccer/futbol action in the parks. You can find pick-up games on couchsurfing community boards or just ask if you can play along. Held on August 5-6 to celebrate Bogota's founding, the carnival is a festive event honoring Colombia's diversity with Comparsas, parades of folkloric groups, dances, ​and music that represent the cultural manifestations from different regions and cultures of the country and Verbenas, celebrations in suburban streets with dances, music, games and gastronomy from different regions of the country. Expoartesanías is the place to find the best traditional and modern Indian and Afro-Colombian handcrafts. It offers products made of different natural raw materials like fibers, fabrics, wood, silver, gold, ceramic and stone, among others. From its beginning in 1991, the main objective of Expoartesanias has been to lead handcraft product trends in the market. While these might not be to everybody's taste, Colombians love a good challenge between bullfighter, the torero, matador, and the bull. Bullfighting season is January through February, but small displays are held throughout the year. Columbia is known for its emeralds! There are also plenty of shopping options of other jewels, antiques, clothing, leather goods and other desirable goods. There's a wide variety of shopping at all price points. Check out Zona T, the nightlife and shopping neighborhood for high-end fashion. The shopping mall El Retiro is moderately priced if you forget anything at home. If you're on a budget the markets sell coffee and make great souvenirs. The Palace of San Francisco is an example of the Republican style that was fashionable at the beginning of the 20th-century in the capital of Colombia. In 1984, it was declared a national monument and is currently occupied by one of the biggest schools in the city, Nuestra Senora del Rosario. Bogotá has one of the largest urban parks of the world, the Simón Bolívar Metropolitan Park, the center of a recreational area that includes the Botanical Gardens of Bogotá, the headquarters of Coldeportes (the national sports authority), and the recently finished Virgilio Barco Library. "El Tunal" park hosts the annual Rock al Parque, a free festival in which new and popular Latin rock bands show their talent. Bogota has some amazing museums and art galleries. View the fabled collections of gold artifacts in the Gold Museum, and tour other museums: Museo Arqueologico, Museo de Artes y Tradiciones Populares, Museo de Arte Colonial, Museo de Arte Religioso, Museo Nacional, Museo de Arte Moderno, and Quinta de Bolivar for a glimpse of Colombian patrimony, art and cultural influences.